Flaky Grilled Fish Fillet Recipe | Your New Go-To Grilled Fish Recipe! 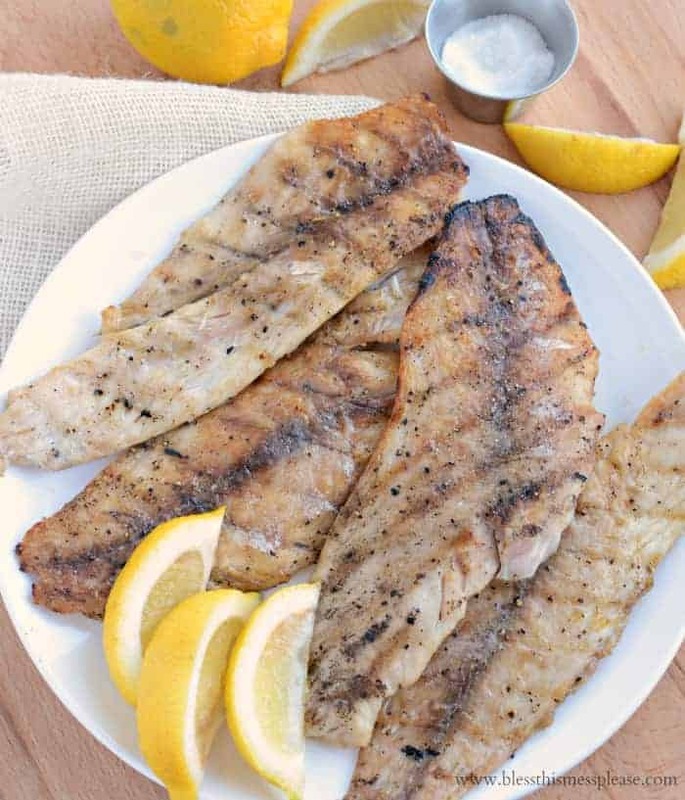 Ever wonder how to get perfectly flaky grilled fish fillets on the grill? This recipe is the simplest and best way to grill just about any firm white fish! Welcome summer! 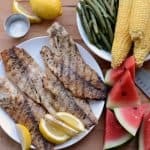 When you combine a few pounds of beautiful fish fillets, amazing seasonal produce, and the grill, you are in for one simple yet perfect dinner. 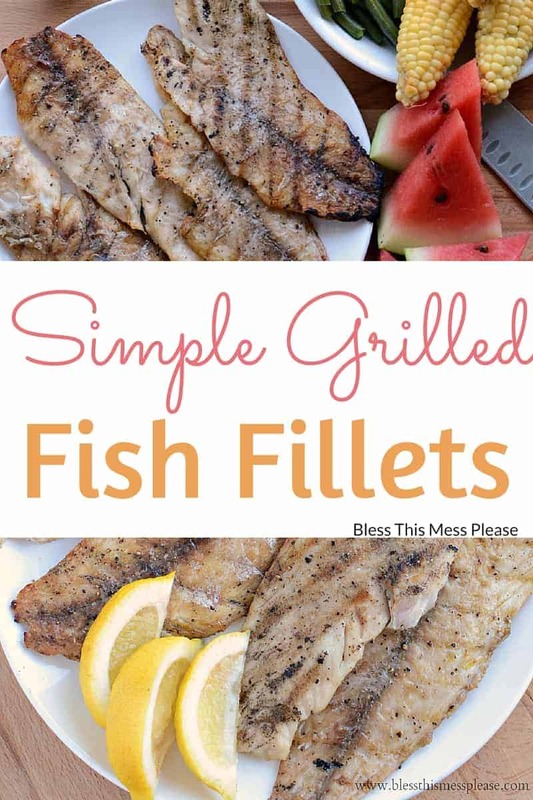 This recipe for simple grilled fish fillets is amazing. It takes about 5 minutes to prep, 7 minutes on the grill, and you are done. I can’t wait for you to try it. Add a side of watermelon, some corn on the cob, and fresh green beans and you’ll have dinner done in about 30 minutes with little to no effort! This is one of my ideal healthy simple meals and I could eat it once a week for the rest of my life and die a happy woman. What I love too, is that you can literally pair it with just about anything that you have on hand and want to use. I like recipes like this because then I can hit up the farmer’s market or my garden, pick gorgeous fruits and vegetables and use them for the sides to this really simple but delicious main dish grilled fish recipe. It’s simple, it’s classic, and it’s always a hit in this house. You have a lot of options when it comes to what kind of fish to grill. I tend to stick with less expensive fish like tilapia, catfish, cod, and pollock. All of these firm white fish are mild tasting and really easy to throw on the grill. Don’t under salt this recipe and don’t forget the lemon. Because it is so simple, they really bring the needed acid and salt to a simple fish recipe. When buying fish I like to find wild caught fish and I prefer when they are individually sealed if frozen. That way I can take just the few I need out of the freezer while the rest stay frozen. I have great luck buying high quality fish at Costco. Don’t skimp on the oil. It help the fish to not stick the grill. No outdoor grill? I’ve had great luck making this recipe on a grill pan inside. 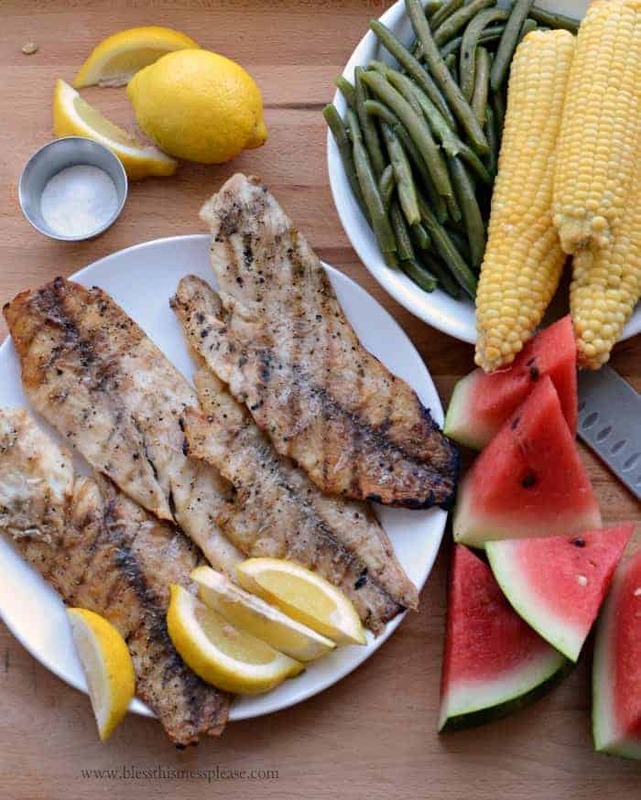 I love this fish recipe with really simple sides like corn, green beans, and watermelon. It’s also great with a side of crusty bread, with some simple Santa Fe Rice, any of these 8 pasta salad recipe, or served with roasted vegetables. You can’t go wrong with any of those! Ever wonder how to get perfectly flaky grilled fish on the grill? This recipe is the simplest and best way to grill just about any firm white fish! Rinse the fish and lay it onto paper towels. Use the paper towels to pat the fish dry and place the fillets on a wire rack (a baking or cooling rack placed inside of a baking sheet works great to catch any drips and spills). Sprinkle half the salt and half the pepper over the fish. Carefully drizzle half of the olive oil over the seasoned fish. Using a pastry brush or your fingers, evenly distribute the oil all over that side of the fish. Flip the fish over on the rack and repeat with remaining salt, pepper, and oil. Let the fish rest and marinade while you fire up the grill. Turn your grill on to high and allow it to heat for 5 to 10 minutes until the grill is very hot. Carry the fish out and open the lid to the grill, it should be very hot. Use a brush to scrap the grill grate clean and then lower the temperature to low. Place the fish on the grill, close the lid, and leave the fish to cook with the lid closed, without turning for 7 to 10 minutes (chances are really good your fish will be done right at 7 minutes unless it is very thick, check it 7 minutes!). The fish should be white and flakey when you test it with the end of a paring knife. Using a metal spatula remove from the grill. Sprinkle with additional sea salt and lemon juice before serving and then serve with additional lemon slices and chopped parsley to suit individual tastes (the first squeeze of lemon isn’t optional, it makes it amazing, but additional lemon and parsley are up to you or your guests. I didn’t feel like this tasty dish needed anything extra because it was excellent as it was). You can use this cooking method for just about any firm white fish such as catfish, tilapia, pollock, and cod. I can’t wait to hear how this simple grilling method turns out for you. I have done all kinds of things to fish from frying it (always tasty but a little labor intensive) to baking and cooking it in foil. These grilled fish fillets were by far the simplest and best tasting fish I have made. I can’t wait to make it again and plan on putting this into my meal rotation ASAP. 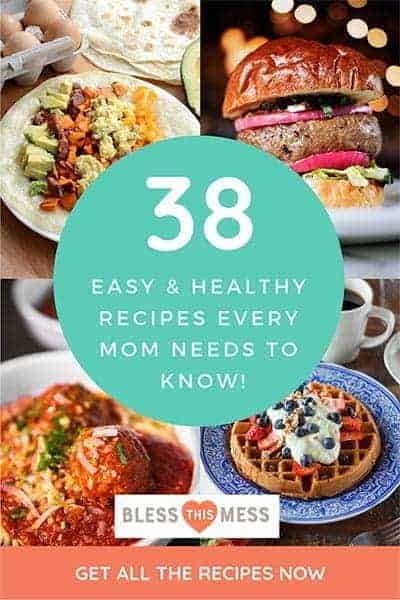 Long live the simple and fool-proof yet crazy delicious recipes! My favorite seafood recipe is ANY recipe that includes pasta and shrimp!! I love how a quick and nutritious dinner comes together with shrimp, pasta, veggies, and a little sauce. This is in my must try list! My family loves fish but I’ve never tried it on the grill. This will be much healthier! Putting it on my grocery list! I love paella marinera from Spain. Shrimp Scampi is my favorite seafood recipe. I love making my homemade Crab cakes. They are so delicious! My favorite recipe is clam chowder. My favorite seafood recipe that i can never turn away is shrimp friend rice. So yummy. My favorite is Blackened Shrimp – oh yum! That is such a tough question to answer because I love seafood! But my favorite seafood recipe would have to be lobster pizza!! I adore Maryland Crab Soup: stewed tomatoes, lima beans, corn kernels, old bay, crabmeat, carrots, beef broth. It’s so yummy! My favorite seafood recipe is Louisiana Blue Crab Gratin. I love crab cakes and grilled tuna! Their fried catfish recipe sounds so good today. I love gumbo….never get tired of it. I like it as spicy as it can be. I love wood fire grilled salmon with a lemon sauce. I love Louisiana Crawfish Casserole. Shrimp is my all-time favorite seafood, and my latest favorite way to prepare it is in a nice shrimp fried rice dish. I have a really good grilled salmon recipe! I’m always looking for new ways to cook fish! I love shrimp grilled on kabobs. So yummy! Looks Delicious! Love your photos! My favorite sea food recipe is shrimp scampi, so good! The only thing I’ve successfully made is fish in a skillet. I want to try grilling by putting the lemon on the grill then the fish. I can’t decide if my favorite seafood is swordfish or halibut. I absolutely love both! Oh, and crab if we go for shellfish. I love any and all crab! This is very similar to the way I season fish fillets, except I like to use fresh Thyme rather than parsley. Yummy! Jacob would die if I made him this. I can’t stand fish but he loves it! If I win, I’ll send you Big Cheese! cooked perfectly! looks so good. Hope mine turns out as good as this!! I really like fresh fish tacos. I like Shrimp Fettuccine Alfredo and have also made a version as a pizza, it was yummy! Coconut shrimp is one of my favorites. I like to make Asian Salmon. Soy sauce, lime juice, garlic and ginger…leads to a tasty dinner! My favorite seafood dish is called Langosta Frita. We order it at our local tapas restaurant. It’s so delicious! I love making Caribbean fish with almost any kind of fish, some good jerk seasoning, and a bed of coconut rice and black beans. Crabcakes are a favorite of mine to make. I’m not big on seafood. I’ll eat frozen fish sticks though. I love Coconut Shrimp and also garlic shrimp equally. Thanks so much. Shrimp Cocktail served with a Marie Rose sauce. I love Jumbo Lump Crab Cakes. I love making sockeye salmon with my special napa valley sauce – so good! I like the jumbo crab cakes. I love Lobster Bisque! The secret is good fresh tarragon leaves. I’ll eat tuna noodle casserole or a tuna sandwich but otherwise I’m not a fan of seafood. I like to make pasta with garlic shrimp. I love to make salmon on cedar planks or a seafood gumbo with black-eyed peas. I love grilled shrimp, simply served with a lime butter sauce. I actually do not have a fav seafood recipe because I do not eat any type of seafood. I hope that is OK and my answer can still count toward the contest. I am just being honest. 😀 Thanks for the chance to win! I love spicy grilled shrimp. 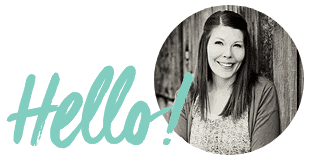 I like crab cakes and lobster and oysters…..
We do simple shrimp alfredo but I think I would like to try the Crab Cake Pasta Salad recipe from their site. Thank you! I would love garlic shrimp. I like LOTS of seafood, so cioppino is my favorite, with lots of crusty bread for dipping. My favorite seafood recipe is Maryland Crab Dip; but from their list, I’d love to try the crab imperial. I love shrimp or lobster fried rice. I love sea bream ceviche with fresh coriander ; with extra fresh fish, it’s just incredibly good ! I love sea bream ceviche with fresh coriander ; with extra fresh fish, it’s just incredibly good !! I absolutely love coconut shrimps ! I would love to make the Jumbo Lump Crabcakes! I heart a seared ahi tuna! My favorite is coconut shrimp. My fave is coconut shrimp, it’s amazing! I absolutely love shrimp scampi. I love seafood salad and lobster rolls. Barbecue Shrimp is a very tasty dish, with jumbo grilled shrimp. I love cajun fried alligator tail! So tasty! I love a good lowcountry boil or beaufort stew..it’s shrimp, corn, potatoes, onion, sausage and sometimes crab.. I love dry scallops seared in a hot pan over some wild mushroom risotto, yummy! I love to eat boiled shrimp with a flavored butter sauce. I love fried catfish the way my Mom made it, but mine never turns out the same so I like to make shrimp scampi. My family loves crawfish fettucine. I love crawfish and shrimp fettucine. Lobster Bisque is my favorite. My favorite seafood dish is Paella Just Love it! Yummy, yummy, yummy! I absolutely loved this! Thank you. Mmm! I love this simple, crispy fish!